Retromuscular ventral hernia repairs have become increasingly popular, both with and without transversus abdominis release. We aim to describe our 90-day outcomes in patients who underwent robotic retromuscular ventral hernia repair (RRVHR). All patients were subcategorized into those who underwent a TAR (TAR+) as part of their repair, and those who did not (TAR−). Patient demographics, comorbidities, hernia characteristics, and LOS were studied. Perioperative complications were reviewed in four different time frames up to 90 days. All hernias and complications were classified using the recommended classification systems. 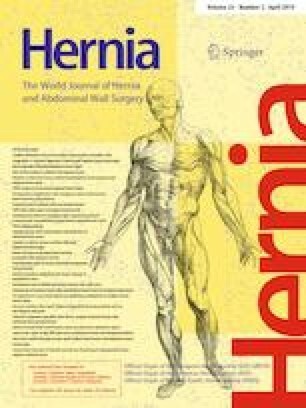 Appropriate univariate analyses and multivariate regression analyses were performed to determine the hernia characteristics which required a TAR technique, and risk factors which associated with the development of complications. Of 454 robotic ventral hernia repairs, 101 patients who underwent RRVHR were included into the study. Of these, 54 patients underwent RRVHR with TAR while the remaining 47 patients underwent repair without TAR. Incisional hernias, off-midline locations, and larger size defects were factors that required the addition of a TAR. In 9.9% patients, an unplanned TAR was performed. Postoperative pain assessment was similar in both groups. LOS was significantly longer for TAR + group (p < 0.001). The median Comprehension Complication Index® score was 8.7 (range: 0–42.4) for all patients and was significantly higher for TAR+ group (p = 0.014). Complications were higher in the TAR+ group as compared to the TAR− group (p = 0.028), though this difference did not persist in follow-up. Most complications were minor (Clavien–Dindo grade-I and -II). The development of complications was only associated with the presence of an incarcerated hernia at repair. RRVHR is safe and feasible. 9.9% of our cohort required a TAR that was unplanned, particularly incisional hernias. TAR patients may be more prone to complications in the immediate post-operative period, however, the difference between patients with and without TAR adjuncts resolved at 90 days.